3 - 3..........Odin von Forell. 5 - 5..........Bordo von Fürstenfeld. 5 - 5..........Bingo vom Dornberg. DVIN Working Vice Champion in 1985. DVIN Working Champion in 1984. DVIN Working Vice Champion in 1983. Winner of the 'John v. Vorselen Trophy' in 1983. Winner of the 'Heini Cup' in 1983. Winner of the 'Eendracht Cup' in 1983. CAC/CACIB: Amsterdam Winner Title in 1983. Reserve CAC: KCM de France in 1983. Björn van Stokebrand was one of the premier working males in the Netherlands and in 1983 he came second (behind Nicolai vom Kloster-Kamp) DVIN Working Championship with a score of 97 points in the protection work. He followed that up with a DVIN Working title in 1984 with a score of 99 points in the protection work and in 1985 he placed second (this time behind Bonni vom Nettetal) at the DVIN Working Championship with a score of 96 points in protection. “A Dutch bred black dog with an excellent head. In 1983 the German Judge Mr Hensel wrote: “a large male with parallel planes, a lovely long neck, a good tailset, ample fore chest and depth of brisket. Correct tuck-up. He is better angulated in the front than the rear. His colour is good and he has good, dark eyes and tan. His movement is O.K'. Verry: SchH 3, Landesmeister and passed the ZTP with 1A rating for character and V for conformation. He is sire of the von Forell “I” litter (Illex). 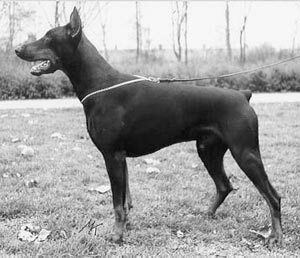 Gog Goliath: SchH 3 and sire of the von Flandrischen Löwen “B” litter (Bella).